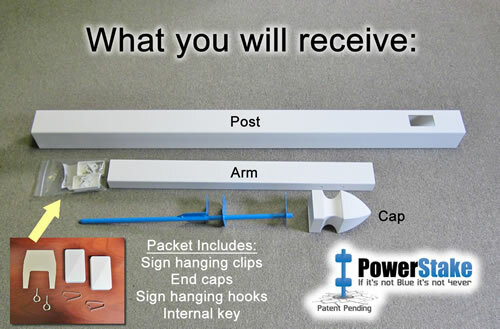 Easy to install, Vinyl Real Estate Post Kit - Choose height and arm length based on your sign size. All of our Vinyl Real Estate Posts are crafted to the highest standards and this real estate sign post is exception. We bought two of these kits - they are easy to set-up, they look nice, and are easy to transport. However, the Sign Clips are not the best - two of the four we received lost their locking tooth right out of the bag. I called and asked to see if that was a common problem to which I was reassured that it wasn't and that they would mail out two replacements for me immediately. It's been almost 3 months and I haven't gotten the replacements. We have used these for years. They hold up well, are easy to clean, and easy to install. Quick service, no surprises; liked the extra clips for rider signs (never had before); wish they were standard. Great quality, so unbelievably easy to put together and to install. (And I am a woman less than 5 ft tall!) Friendly and helpful customer service and quick delivery (2 days!) When I need more posts, I will definitely be ordering from you again. The sign only took me 5 minutes to install this sign while wearing my heels. Why pay someone else to install your signs? This is a quality item that looks great in a yard! Set yourself apart from realtors who just put a stake in the ground and get more calls from your listings with these great looking posts. Do well in windy areas like the Oregon coast too! Real Estate Posts does an excellent job at communicating through the order process. The signs are shipped quickly. The quality of the signs are better than similar signs I have purchased from competitors. Real Estate Posts will now be my "go to" for future orders.